Time for Rainbow Snippets! If you’re new to the snips circuit or have found me by accident… Rainbow Snippets is a Facebook group where GLTBQ writers post snippets of their work every Saturday. There are snips from every genre, kind of pairing and heat level from sweet to steamy. Good afternoon, snippeteers! It’s been a crazy week and will be a crazier weekend, but I am reading my way around all your snippets and I will make it to the end! 🙂 Swings & Roundabouts is out tomorrow, and today is all about distractions. The biggest of which is dinner at a restaurant that features heavily in the Power of Zero books. I’ve been wanting to eat there for ages, and I’m sure I’ll be blogging about it tomorrow, whether I’m wearing my fiction writing or food blogging hats. 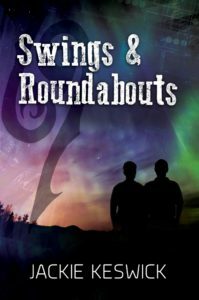 This is going to be one of the final snips from Swings & Roundabouts – maybe another one for next week’s Rainbow Snippets – and then I have to make my mind up what to work on next. For the moment, though, let’s not worry about that. Instead, we’re with Jack, who is as much of a morning person as I am, which means he’s perfectly happy to go to bed at 6am, but getting up at that time is utterly out of the question. Jack couldn’t dredge up the right level of excitement for the planned activities. Why did people put him on ice when he wanted to help, and then made him work when all he wanted was wrap himself around Gareth and spend a day in bed? He revived a little when Gareth held a mug of coffee under his nose, and he woke more when Gareth joined him in the shower. “You’re disgustingly cheerful for so early in the morning,” he accused with a grin. “After last night? You should be glad I’m not singing.” Gareth rubbed shampoo into Jack’s hair, and Jack quit the grouching. He loved it when Gareth washed his hair and Gareth knew it. He might as well enjoy himself. Great snippet! This is both sweet and fun. I love the sensory details. Sweet, playful banter here…talk about a way to cheer up someone who isn’t a morning person! Yes, waking Jack early is not a good plan. Thank you – it’s fun!